We were very busy up to Christmas with lots of fairs and markets including the Builth Wales Winter Fair which was the first time and proved to be very successful so we will going there again this year. Alpaca socks are very popular and as more and more people are trying them they are proving their worth in warmth, longevity and comfort – once you’ve worn alpaca socks you won’t wear anything else! At the beginning of the year I invested in an Omega laser for the using on horses and alpacas. I learnt about the laser through a friend who has been using it for herself, but also on friend’s dogs and sheep. It is a non- invasive low level laser therapy and is brilliant for infections, tendon injuries, trauma injuries and lots lots more. The alpaca is very different to the horse so has to have different protocols due to the thickness of their skin and thinner blood. 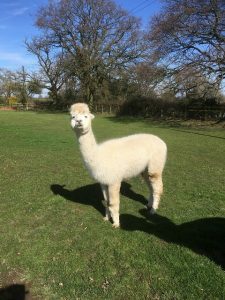 which has been worked out by Professor Gordon Farmer who is a world renowned laser expert on horses and humans and has just recently been working on the alpaca physiology. One of my females who has had a shoulder injury for a very long time and was in a lot of pain has remarkably recovered through using the laser and now has full use of the shoulder and leg – its truly amazing! At the moment I’m using it on an alpaca whose front pads have got holes in them due to the wet which has caused a break down of the pad. It doesn’t cause lameness but there is definitely heat and redness on and around the foot. I’ve treated him every other day for a week and it is much much better. So I’m going on an equine course at the end of April in Newmarket to learn more about it and the various treatments, so it should be really interesting. We are still doing regular Farmer’s markets in Ludlow and Shrewsbury – the dates are on the Events pages and we have also started ‘Made in Shropshire’ in Shrewsbury which are the 2nd Saturday of the month in the market square in the town centre. We will also be open at home every Tuesday 10am – 4pm, so you can see the alpacas and visit our pop-up shop where we have the wonderful hand knits and of course the amazing socks. The next big event we are doing is the British Alpaca Society National Show which is being held at Telford International Centre, Telford, TF3 4JH this coming week-end 23rd/24th March. We are not showing any animals but will have a trade stand. It will be open from 9am – 5pm and will have lots of alpaca related trade stands, and about 600 alpacas who will all be shown in their various categories ending up with a Champion Alpaca based on its quality of fleece and conformation.